this recipe is another one that i had been wanting to try for a while. when i was pulling out vegetarian recipes to try out while staying with my in-laws this was my second choice behind the baked southwestern eggrolls. this was as equally delicious as the eggrolls and has moved over into our favorite recipes category! we did use vegan cheese for this recipe also. it's a brand called go veggie that we just realized they sell at our grocery store. the lactose free cheese we buy isn't grated, so we always have to grate the cheese and that is not one of my favorite things to do. so we found this vegan cheese that was already grated and decided to give it a try! i was a little scared to try it because i am a picky eater, but it honestly tasted just like real cheese. it has more calcium than cheese, and also has less cholesterol and saturated fat so it's a win, win! 3) in a large bowl, combine quinoa, enchilada sauce, green chiles, corn, black beans, cilantro, cumin, and chili powder. stir in 1/2 cup of cheddar cheese and a 1/2 cup of mozzarella cheese. salt and pepper to taste. 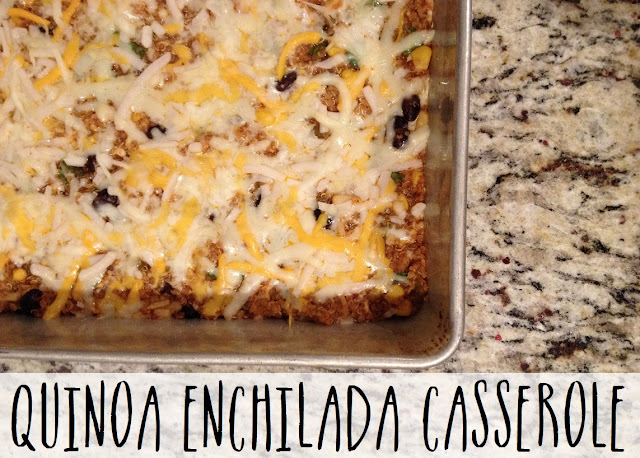 are you a quinoa fan? what are some of your favorite vegetarian recipes?